Doug O’Connell’s Eastwood Park Apartments. Not a Laurentian View apartment, but a similar model in many ways. Image: June 2016. A few days ago, I posted a lengthy story about cluster developments of apartment buildings in suburban neighbourhoods during the 1950s. 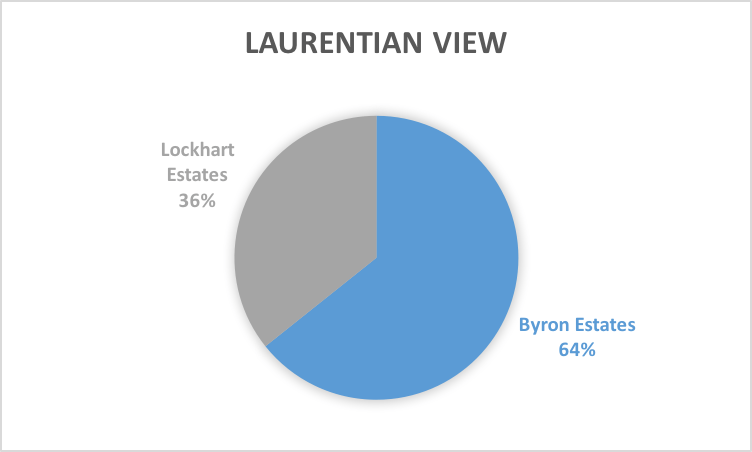 While I made every attempt to be as complete as possible, I had found that information pertaining to the three clusters (two of which were complete and listed in 1955) in the Laurentian View area was somewhat difficult to come by. There were few reports quickly found in either the Journal or the Citizen, and Might’s Directory, being what it is, was less than useful in learning names and ownership at the time. To that end, since it’s just so conveniently located, I headed out for the Land Registry Office. Castle Court. Also not a Laurentian View apartment. I need to get out for another walk. Image: June 2016. Because it’s a long story to scroll through if you’re looking for something, I’ve reproduced the Laurentian View section below. 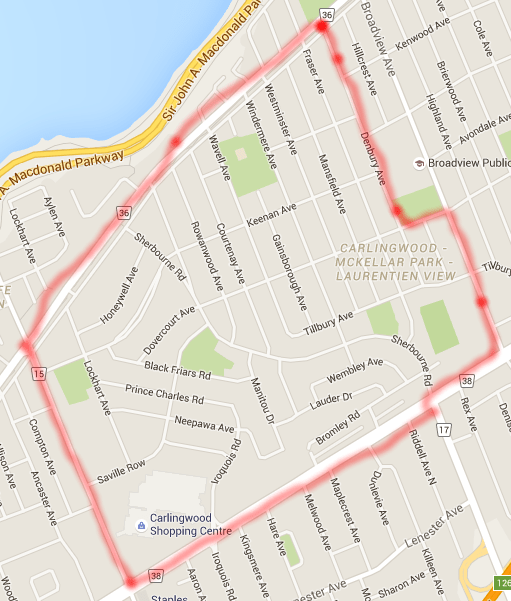 For the purposes of this story, I have collected the neighbourhoods of Carlingwood, Laurentian View, and McKellar Park. As I note above, I acknowledge that these borders are somewhat arbitrary, but that’s the breakdown that made the most sense to me, given modern CA boundaries in particular.1Defining neighbourhoods is always an exercise in arbitrary definition, so I’m a little less concerned about the specifics in this case. I went with the Westboro Community Association’s definition because it is suggestive that those engaged citizens within its defined boundaries see themselves belonging to the Westboro community. In the period following the War, residents of Highland and McKellar Parks fought hard to oppose the construction of apartments in the district, keeping it the preserve of single family homes.2Numerous local residents strongly opposed the construction of an Ontario Hydro office building on Byron because it might “set a precedent that could be used to give the district apartment houses and gas stations.” See “Hydro Takes Second Thought,” Ottawa Journal, September 22, 1951, p. 6. It seems to be the case that this was a losing battle, however, as in 1952 and 1953, A. Bosclair and E.J. 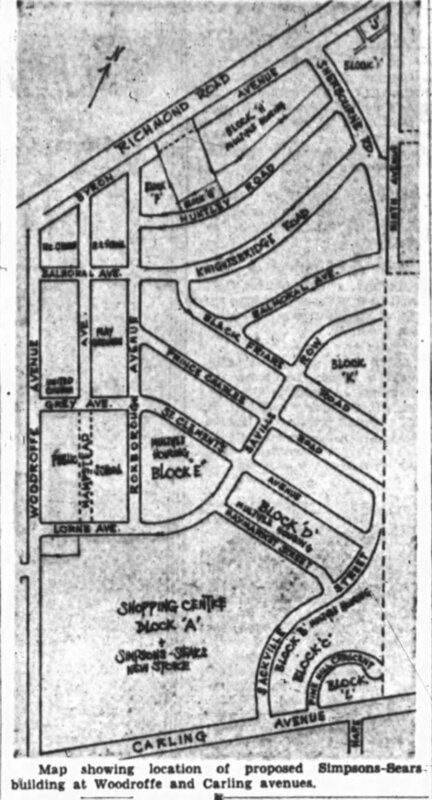 Spincks began apartment construction projects along Byron Avenue.3”CMHC Loans Total $6,000,000 in Ottawa for 6-Month Period,” Ottawa Journal, August 5, 1952, p. 3; “March Building Permits Valued at $3,323,565,” Ottawa Journal, April 30, 1953, p. 14. 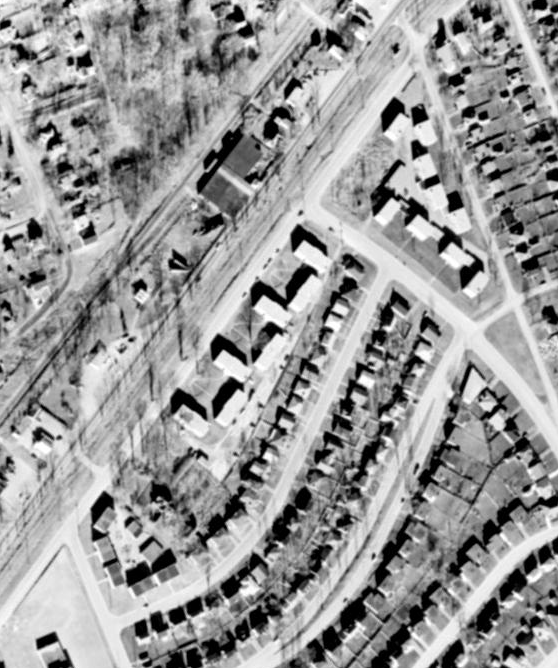 So far as I can tell, in 1955, Laurentian View (which also included the McKellar and Carlingwood4Also known as Westwood during the 1950s and as the old Honeywell Farm before that. areas) contained no apartments developed outside of a cluster scheme. All of the 14 buildings either part of the Byron Estates (Byron and Sherbourne) or the Lockhart Estates (Byron and Lockhart). There is one additional 7 building cluster, adjacent to Lockhart Estates, now called the Byron West Apartments. They don’t appear to have been completed until after the 1955 data was compiled and have therefore not been included. The names and developers of these clusters do not appear to have been published in the local papers and I have not yet had the opportunity to visit the Land Registry for the location. Although it may have been Spincks and Bosclair, I haven’t anything to suggest that it was. 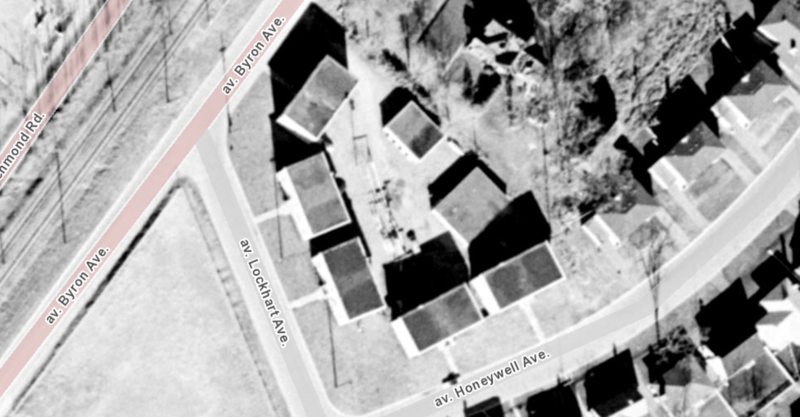 It may have also been the case that these lots were part of the Honeywell Farm (ie. Carlingwood) development and constructed by its developer.5Local residents also took issue with the potential for there being apartments at the north and south ends of the Honeywell Farm development and took the developer to the OMB. See “Home Owners Protest Honeywell Plan,” Ottawa Journal, May 20, 1953, p. 33. To complicate matters further, in January 1955, advertisements were run for the “Woodroffe” and “West End-Woodroffe” Apartments on Byron Avenue “across from the Waltz Inn“. Since all three clusters are located at the northern extent of the Honeywell Farm development and can all be appreciably understood as having been located “across from the Waltz Inn,” this provides little additional clarity. The rental agent was Rhodes and Radcliff, the exclusive agents for the Honeywell Farm development, so that may be both indicative and inconclusive at the same time.6Ottawa Journal, January 5, 1955, p. 34; Ottawa Journal, February 18, 1955, p. 33. The Journal’s reproduction of the Honeywell Farm / Westwood plan. Some of the labels on the one submitted to the Land Registry Office differ from what it above. Source: Ottawa Journal, October 27, 1953, p. 20. What are today known as Lockhart Estates and Byron Estates are located on Blocks ‘F’ and ‘I’, respectively. These two clusters are, as identified above, what were listed in Might’s Directory in 1955 and are searchable on the list contained in the previous story. 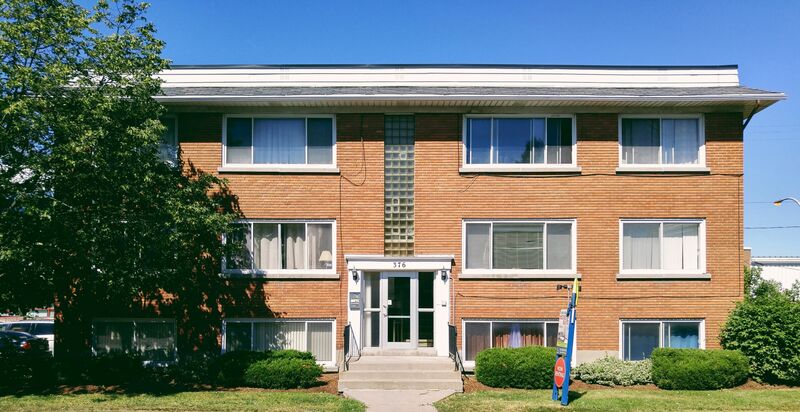 A third cluster, located on Block ‘H’, was constructed through 1955, opened in 1956, and constructed by Doug O’Connell, who sold it to the Honeywell brothers. I will describe this in a separate story. Finally, you may notice Block ‘J’, which is mirrored on this plan from its real location. It is the site of The Byron Apartments today. One of the Lockhart Estates buildings in August 2015. Image: Google Maps. Dockrill’s advertising presence was generally slight. Source: Ottawa Journal, August 11, 1947, p.2. 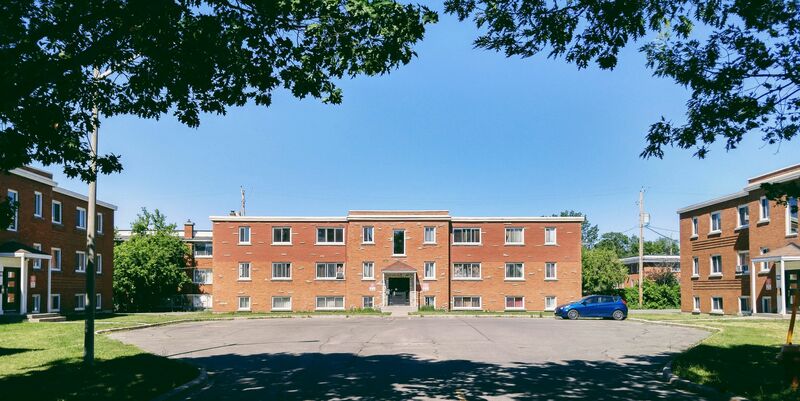 The smaller of the two apartment clusters developed at Laurentian View by 1955 was a small 5-building cluster along Lockhart, the block between Byron and Honeywell. 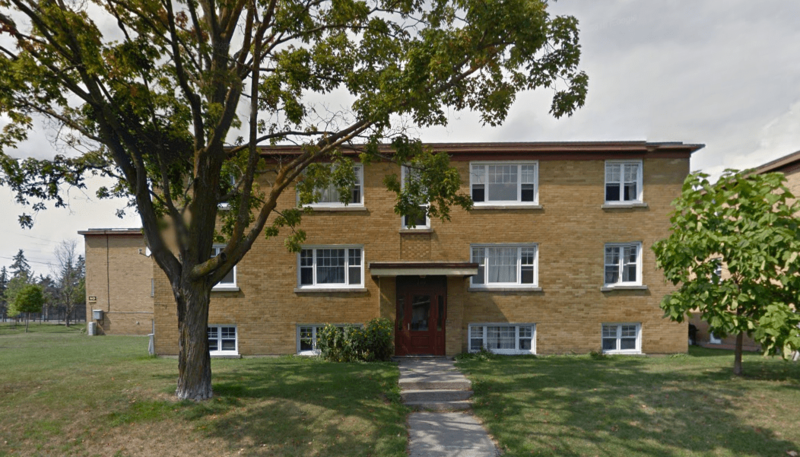 This small cluster of five six-unit apartments was constructed near the end of 1954 by Joseph Walter (“J.W.”) Dockrill, a local insurance agent7Ottawa Journal, February 26, 1948, p. 29. (and president of the Hull Kennel Club)8”J.W. Dockrill Heads Hull Kennel Club,” Ottawa Journal, June 10, 1948, p. 24; “Pup Training Start Time Ten Weeks,” Ottawa Journal, September 25, 1952, p. 14. who had recently entered into the construction business, chiefly building individual homes.9Ottawa Journal, October 7, 1949, p. 35; Ottawa Journal, November 7, 1950, p. 16; Ottawa Journal, June 14, 1951, p. 11; Ottawa Journal, July 24, 1952, p. 9; Ottawa Journal, April 30, 1953, p. 14. 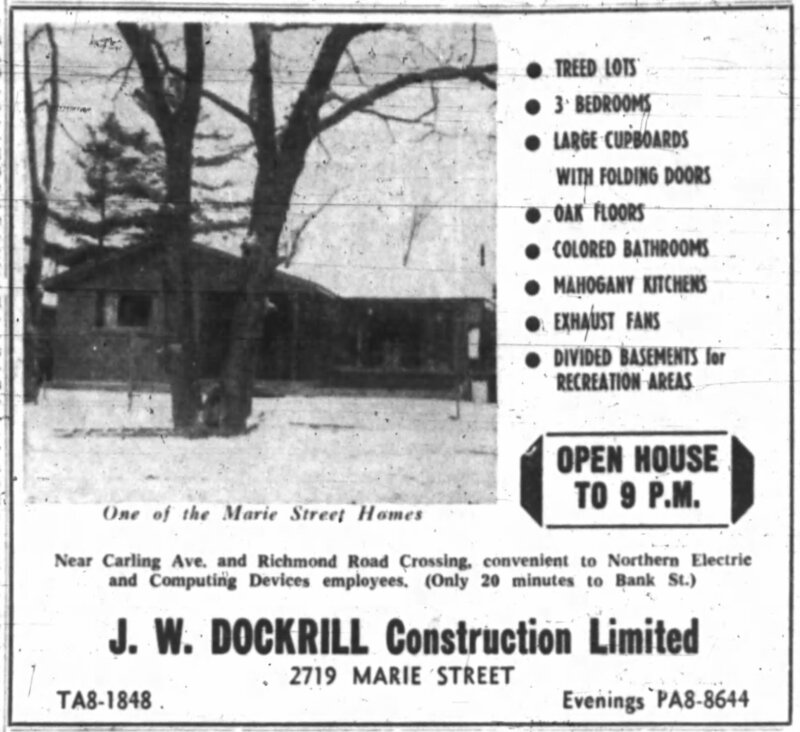 It appears to be the case that Dockrill constructed his first apartment building along Thames street in 1953.10Ottawa Journal, April 30, 1953, p. 14. J.W. Dockrill was also charitable. Source: Ottawa Journal, October 15, 1948, p. 12. In October of 1954, Dockrill purchased Block F from Westwood Lands Ltd., the Westwood Interests’ subsidiary in charge of the housing development.11Ottawa Land Registry Office, Plan 314928, Block F, Reel 4AR115; “Simpsons-Sears Building $3,000,000 West End Store,” Ottawa Journal, October 27, 1953, p. 1. Dockrill completed the five buildings in short order and began to sell them off to interested buyers for about $52,000 each.12For example, one sold to Rachel Lapointe on February 1, 1955 for $52,000, one to Carmel Hicks for $52,500 on September 16, 1955, and one to Kenneth H. and David E. Hicks (Kordal Investments) for $52,000 on June 7, 1957. See Ottawa Land Registry Office, Plan 314928, Block F, Reel 4AR115. In each of these cases, the apartments were subsequently purchased by Jack Aaron in 1958.13Ottawa Land Registry Office, Plan 314928, Block F, Reel 4AR115. Aaron should sound familiar, as he was a partner involved with John Chenier’s Carling Court Apartments. J.W. Dockrill’s unnamed Block F apartments in 1958, around the same time they were purchased by Jack Aaron. Image: geoOttawa. It does not appear to be the case that this small cluster was given a name for many years. The current name of “Lockhart Estates” appears to be a name of a very recent vintage. Housing was Dockrill’s bread and butter. Source: Ottawa Citizen, September 20, 1957, p. 45. In spite of his willingness to construct apartment buildings as an investment, J.W. Dockrill preferred to focus his efforts on the construction of single family homes, just has he had started in on the trade. 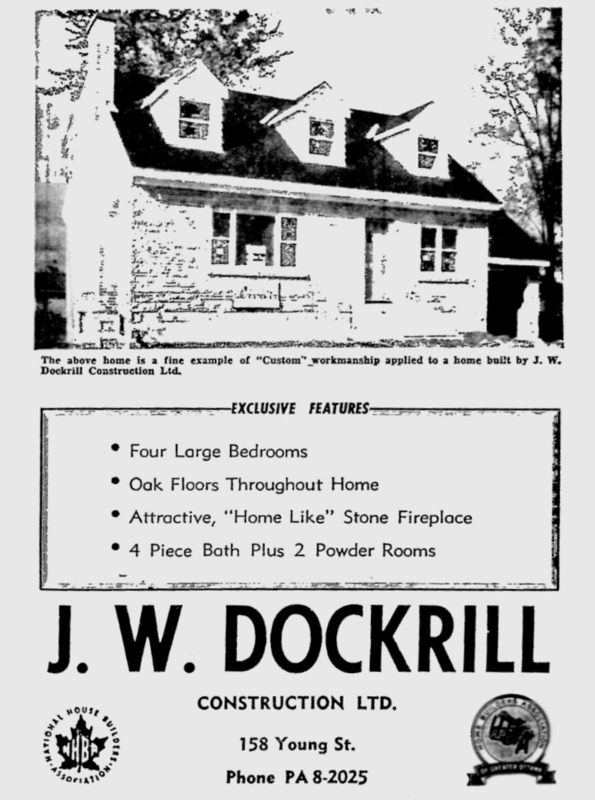 In spite of his being willing to construct apartments, Dockrill’s focus remained the single family home. Source: Ottawa Journal, January 12, 1962, p. 35. Dockrill passed away on May 10, 1962 at the age of 48.14Ottawa Journal, May 12, 1962, p. 24. One of the Wedgewood Court apartments in 2015. Image: Google Maps. On July 21, 1954, the firm of Greene & Scrivens (or Scrivens & Greene, as it was frequently styled in the local papers) purchased Block I from Westwood Lands Ltd. for $30,000, subject to building restrictions.15Ottawa Land Registry Office, Plan 314928, Block I, Reel 4AR115; Which are, so far as I can tell, part of the generalized McKellar restrictions that were in place at the time. For apartments, the most relevant restriction is that nothing in excess of two storeys could, in general, be constructed, which these apartments conform to. See “Restrictions at McKellar Approved,” Ottawa Journal, April 6, 1954, p. 2. The outfit took out a $348,000 mortgage on the property in August and quickly got to work.16Ottawa Land Registry Office, Plan 314928, Block I, Reel 4AR115. 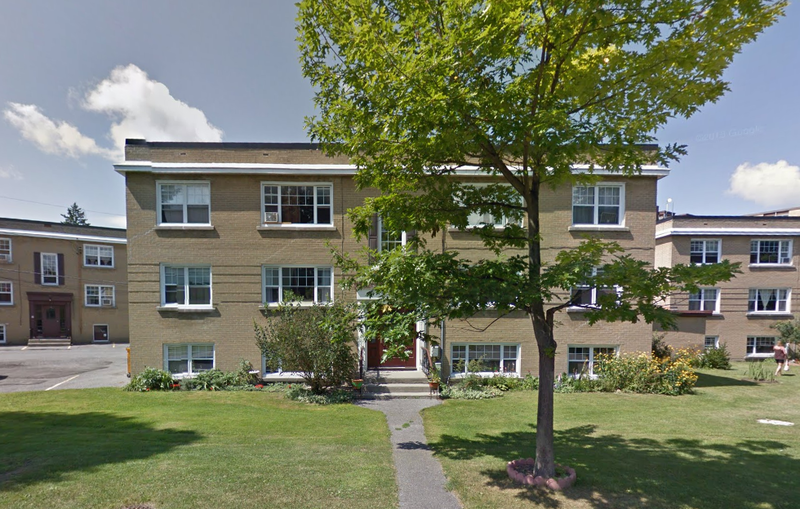 They quickly completed the buildings, filled them, and and on September 9, 1955, they were sold to Anne Aaron and Esther Aronson, who were operating as Slater Realty, for $440,000.17Ottawa Land Registry Office, Plan 314928, Block I, Reel 4AR115. It was reported in the Journal as a $450,000 sale of the 9 buildings by Scrivens and Greene to Slater Realty Co.18”Apartments Sold for $450,000,” Ottawa Journal, August 23, 1955, p. 29. Ottawa is introduced to the Wedgewood Court Apartments. Source: Ottawa Journal, March 19, 1955, p. 31. The Wedgewood Court Apartments, as the cluster of six-unit walkups was named, was said to be situated in the Westwood Gardens area of McKellar Park. As a reminder that names given for real estate purposes don’t always last, or are even picked up at all, both names appear in the Journal only three times: in the three advertisements run for the development, and in the report of sale.19Ottawa Journal, March 12, 1955, p. 15; Ottawa Journal, March 19, 1955, p. 31; Ottawa Journal, March 31, 1955, p. 14; “Apartments Sold for $450,000,” Ottawa Journal, August 23, 1955, p. 29. The name “Wedgewood Court” was later adopted for a street in Blackburn Hamlet by its developer, Costain.20Saul Svirplys. “Costain in Ottawa – Part One: Blackburn Hamlet (Detached Homes),” Mid-Century Modern and 1970s-Era Ottawa (April 10, 2016). Wedgewood Court’s model unit was furnished by Murphy-Gamble. Source: Ottawa Journal, March 12, 1955, p. 15. While not unheard of and even reasonably common for single family homes in larger developments,21For Manor Park, A.J. Freiman even had complete room mockups and a scale model of the development. 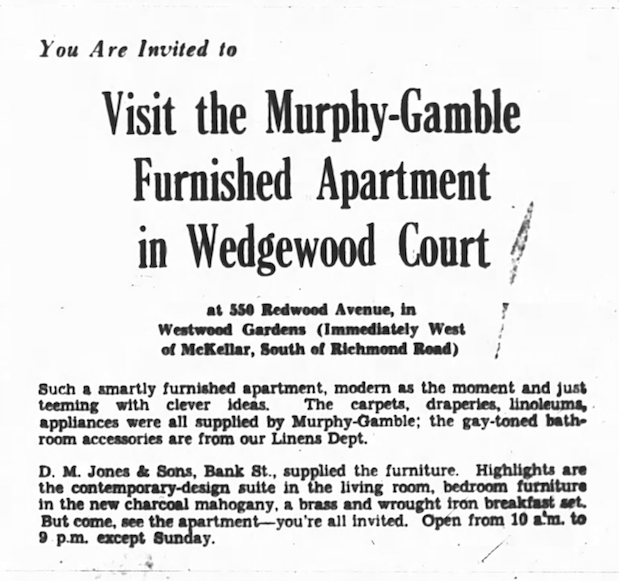 that Wedgewood Court was advertised in partnership with Murphy-Gamble for the decoration and furnishing of the model unit was quite in Ottawa for a rental apartment building at the time. The advertisement run in the Journal boasted a “smartly furnished apartment, modern as the moment, and just teeming with clever ideas.”22Ottawa Journal, March 12, 1955, p. 15. When the ad was run, Wedgewood’s exclusive broker (and co-owner at the moment) W.H. Scrivens, boasted that a full 24 of the development’s 54 units were rented. The reader was situated thusly: “‘midst the beautiful shade trees and overlooking a wide expanse of property are nine apartment buildings, each housing six modern, fully equipped apartments decorated in soft pastel shades.”23Ottawa Journal, March 19, 1955, p. 31. Wedgewood Court was laid out with garages in the rear, “so that no motor traffic will impede the front view.”24Ibid. It was also sold as an architectural achievement, with a simple and clean design that eliminates a common hassle of large heating radiators, by adopting a baseboard style hot water heaters.25Ibid. I’m always a fan of the language employed in advertising copy during the 1950s for apartments. “The sparkling tiled bathroom in each apartment is adjacent to bedrooms, leading off a small hall in which are such pleasant surprises as a linen closet and extra clothes cupboard. Two large china cabinets separate the kitchen from the spacious dining area, which is roomy enough to contain a full-sized dinging set. Kitchens are the height of modern ingenuity for the busy housewife – they are equipped with large arborite counters, up-to-the minute refrigerators and 4-burner electric ranges. Structural points of interest are: the separate sound-proofing features in ceilings and walls, also the extra sub-floor which eliminates dampness in the year ’round lower apartments.”26Ibid. 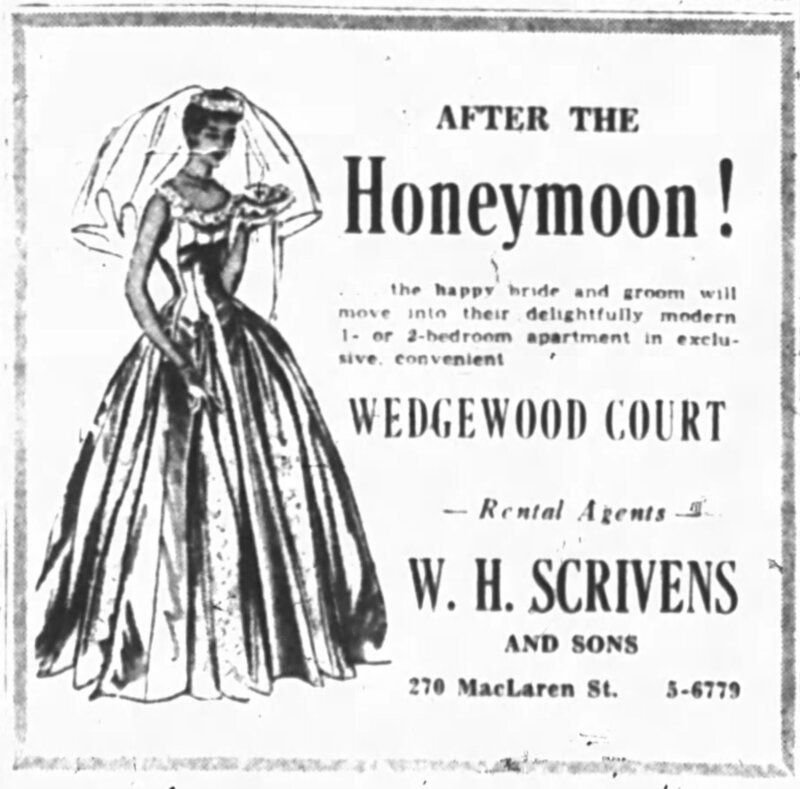 To stress the domestic angle, Scrivens had ads run in a bridal feature as well. Source: Ottawa Journal, March 31, 1955, p. 14. If you would like to see the interiors of Wedgewood Court today, see current owner and manager Byron Rental Properties’ list. Wedgewood Court Apartments in 1958 before the construction of Bertram Witt’s Byron Apartments. Image: geoOttawa. 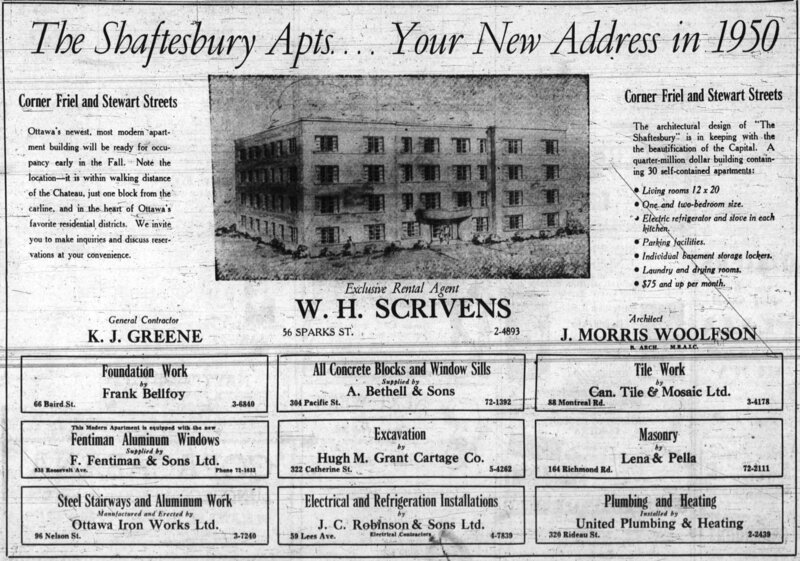 Wedgewood Court’s builders, Scrivens & Greene, is better understood as being the partnership between William H. Scrivens, of W.H. 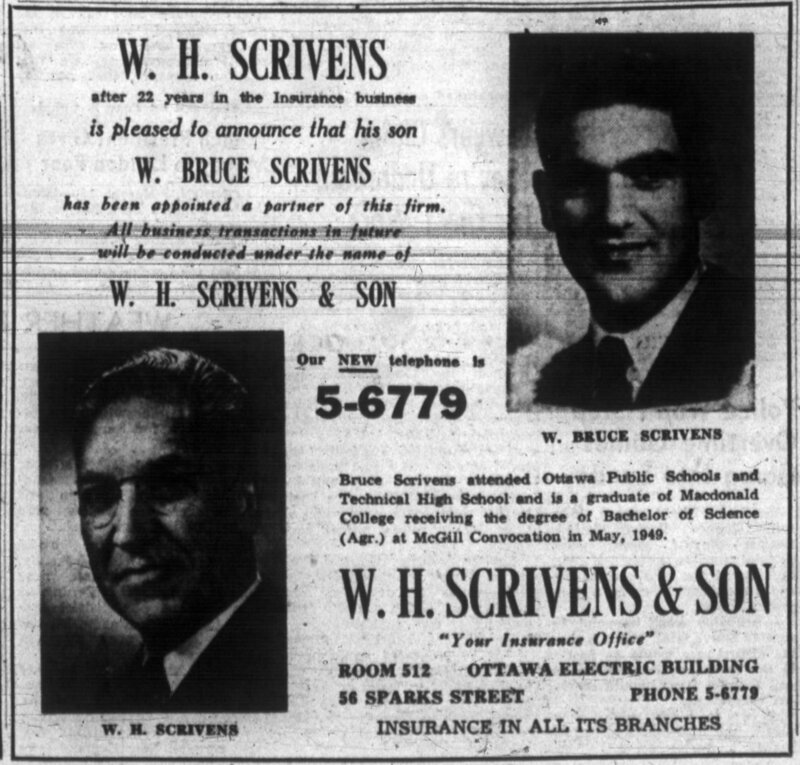 Scrivens and Son General Insurance,27Ottawa Journal, March 11, 1950, p. 2. and builder Kenneth J. Greene, who was then one of Ottawa’s best-established builders. If Greene seems familiar to these stories, it is because he was the owner/developer of Riverside Terrace, and its subsequent replacement project, Island Park Towers. Even as a semi-/formal partnership, this nine building cluster development was not Scrivens & Greene’s first rodeo. The team of Scrivens and Greene had been involved in a number of property transactions through the late 1940s and in to the the 1950s, at locations across the city.28See the following for examples: “Plaza Building $350,000 Sale, Largest Property Deal in May,” Ottawa Journal, June 8, 1946, p. 10; (involving a purchase from Rupert McClelland) “Hydro Sale at $789,250 Leads January Property Sales,” Ottawa Journal, February 6, 1950, p. 22; “$135,000 Bank St. Transfer Largest Deal in November,” Ottawa Journal, December 13, 1951, p. 32. The pair also partnered up to construct the Shaftesbury Apartments in Sandy Hill at Friel and Stewart streets in 1950.29Ottawa Journal, January 21, 1950, p. 21. The Shaftesbury, a project of Wm. Scrivens and Ken Greene. Source: Ottawa Journal, January 21, 1950, p. 21. 1. ↥ Defining neighbourhoods is always an exercise in arbitrary definition, so I’m a little less concerned about the specifics in this case. I went with the Westboro Community Association’s definition because it is suggestive that those engaged citizens within its defined boundaries see themselves belonging to the Westboro community. 2. ↥ Numerous local residents strongly opposed the construction of an Ontario Hydro office building on Byron because it might “set a precedent that could be used to give the district apartment houses and gas stations.” See “Hydro Takes Second Thought,” Ottawa Journal, September 22, 1951, p. 6. 3. ↥ ”CMHC Loans Total $6,000,000 in Ottawa for 6-Month Period,” Ottawa Journal, August 5, 1952, p. 3; “March Building Permits Valued at $3,323,565,” Ottawa Journal, April 30, 1953, p. 14. 4. ↥ Also known as Westwood during the 1950s and as the old Honeywell Farm before that. 5. ↥ Local residents also took issue with the potential for there being apartments at the north and south ends of the Honeywell Farm development and took the developer to the OMB. See “Home Owners Protest Honeywell Plan,” Ottawa Journal, May 20, 1953, p. 33. 6. ↥ Ottawa Journal, January 5, 1955, p. 34; Ottawa Journal, February 18, 1955, p. 33. 7. ↥ Ottawa Journal, February 26, 1948, p. 29. 8. ↥ ”J.W. 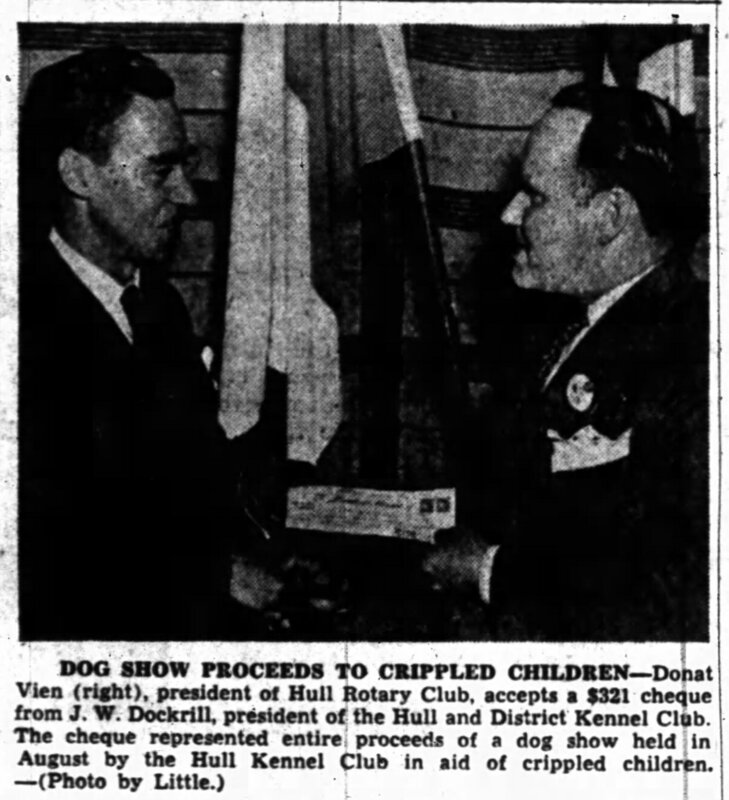 Dockrill Heads Hull Kennel Club,” Ottawa Journal, June 10, 1948, p. 24; “Pup Training Start Time Ten Weeks,” Ottawa Journal, September 25, 1952, p. 14. 9. ↥ Ottawa Journal, October 7, 1949, p. 35; Ottawa Journal, November 7, 1950, p. 16; Ottawa Journal, June 14, 1951, p. 11; Ottawa Journal, July 24, 1952, p. 9; Ottawa Journal, April 30, 1953, p. 14. 10. ↥ Ottawa Journal, April 30, 1953, p. 14. 11. ↥ Ottawa Land Registry Office, Plan 314928, Block F, Reel 4AR115; “Simpsons-Sears Building $3,000,000 West End Store,” Ottawa Journal, October 27, 1953, p. 1. 12. ↥ For example, one sold to Rachel Lapointe on February 1, 1955 for $52,000, one to Carmel Hicks for $52,500 on September 16, 1955, and one to Kenneth H. and David E. Hicks (Kordal Investments) for $52,000 on June 7, 1957. See Ottawa Land Registry Office, Plan 314928, Block F, Reel 4AR115. 13. ↥ Ottawa Land Registry Office, Plan 314928, Block F, Reel 4AR115. 14. ↥ Ottawa Journal, May 12, 1962, p. 24. 15. 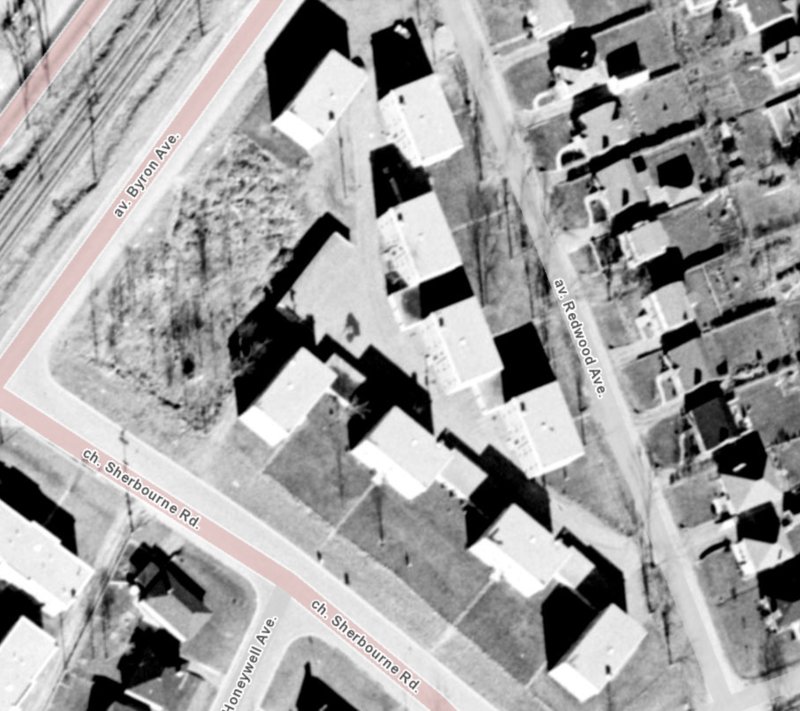 ↥ Ottawa Land Registry Office, Plan 314928, Block I, Reel 4AR115; Which are, so far as I can tell, part of the generalized McKellar restrictions that were in place at the time. For apartments, the most relevant restriction is that nothing in excess of two storeys could, in general, be constructed, which these apartments conform to. See “Restrictions at McKellar Approved,” Ottawa Journal, April 6, 1954, p. 2. 16. ↥ Ottawa Land Registry Office, Plan 314928, Block I, Reel 4AR115. 17. ↥ Ottawa Land Registry Office, Plan 314928, Block I, Reel 4AR115. 18. ↥ ”Apartments Sold for $450,000,” Ottawa Journal, August 23, 1955, p. 29. 19. ↥ Ottawa Journal, March 12, 1955, p. 15; Ottawa Journal, March 19, 1955, p. 31; Ottawa Journal, March 31, 1955, p. 14; “Apartments Sold for $450,000,” Ottawa Journal, August 23, 1955, p. 29. 20. ↥ Saul Svirplys. “Costain in Ottawa – Part One: Blackburn Hamlet (Detached Homes),” Mid-Century Modern and 1970s-Era Ottawa (April 10, 2016). 21. ↥ For Manor Park, A.J. Freiman even had complete room mockups and a scale model of the development. 22. ↥ Ottawa Journal, March 12, 1955, p. 15. 23. ↥ Ottawa Journal, March 19, 1955, p. 31. 27. ↥ Ottawa Journal, March 11, 1950, p. 2. 28. ↥ See the following for examples: “Plaza Building $350,000 Sale, Largest Property Deal in May,” Ottawa Journal, June 8, 1946, p. 10; (involving a purchase from Rupert McClelland) “Hydro Sale at $789,250 Leads January Property Sales,” Ottawa Journal, February 6, 1950, p. 22; “$135,000 Bank St. Transfer Largest Deal in November,” Ottawa Journal, December 13, 1951, p. 32. 29. ↥ Ottawa Journal, January 21, 1950, p. 21.